Here in Colorado, we love our sunshine. And the best way to enjoy the sunshine is by being outside. Maybe that’s why today’s favorite, most easily sold houses include outside space for entertaining. Sitting and relaxing, entertaining with friends, even creating a feast before the big game is all a little easier when you have gourmet cooking available when your space is built the right way. 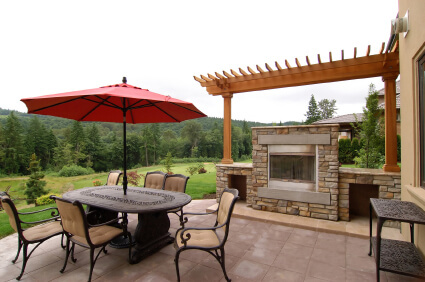 Having an outdoor kitchen and entertaining area is the key to making all of this happen. And while it’s easy to dream big with your outdoor space, the one material that will help put all your dreams in proper place is with the use of tile. Tile is the most versatile material available for all of your remodeling projects. Tiles can be used to finish off everything in your outdoor entertainment area. Tile creates a solid look that’s easy to clean, easy to maintain. And when it comes to selecting your tile, the possibilities are endless. Why not choose travertine? Or natural stone? If you want to create a seamless transition from your kitchen and eating space inside, to your kitchen and entertaining area outside, why not use the same tiles for the entire project? Even here in Colorado where temperatures easily dip below 0 degrees a few days of the year, tile is the perfect choice to create elegant and sophisticated spaces inside and out. Ready to start planning your new space? The best place to start is with a few ideas. Stop by today and see our complete selection of tile, and let your imagination kick in.